Who can resist flamingos? They are elegant, beautiful, exotic, and positively enchanting. 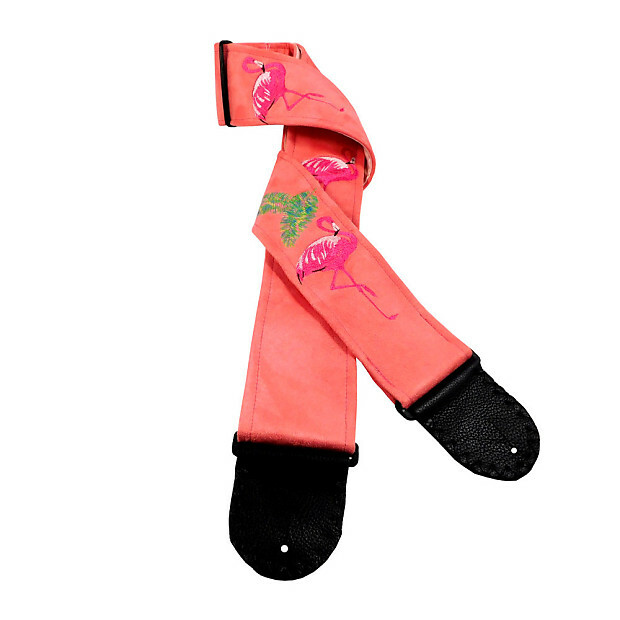 This artisan handmade guitar strap taps into our mesmerizing fascination with flamingos. The front fabric of the guitar strap is gorgeous coral ultrasuede embroidered with four classically posed flamingos in rich shimmering threads of fuchsia, pink, and black. Above the front flamingo are overlapping palm fronds embroidered in variegated threads of green, yellow, blue, and pink. The back lining of the guitar strap is lush pastel pink Duchess satin and the pin tabs are double thick hand punched and hand stitched top quality black Brazilian textured leather. This guitar strap is absolutely dazzling and is one you will be proud to put on your shoulder.